We were gifted with honey the first of July. Everyone who has experienced Shungite Honey know it is something special. DISCLAIMER: Cosmic Reality Shungite, Inc. is facilitating this research project and making no claims as to the benefit of Shungite on bees. All information provided regarding our Shungite is considered “anecdotal” at this time. It is an ongoing process of research and it is only with your participation that we can determine if Shungite is beneficial for bees. We are providing the Shungite products without charge. 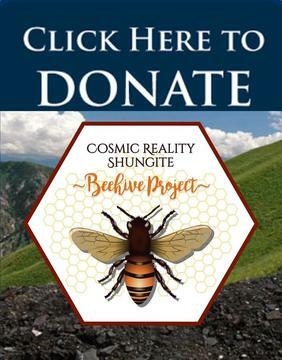 PLEASE DONATE so we can get as much Shungite to the hives as possible. Face Book Group "Shungite Beehives"